Hand cut and impressed with textiles these patchwork mosaics are as visually pleasing as they are tactile. 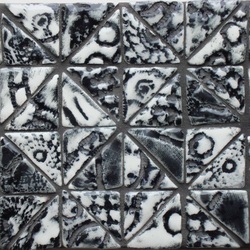 Black and white mosaics show the beauty of the patterns and textures simply and elegantly. Beautiful colour variations can can be created to order. Great detail can be achieved from vintage textiles. 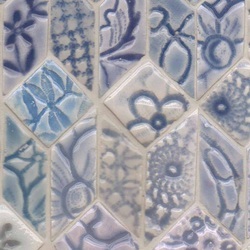 Patchwork mosaics are available ungrouted on mesh backing for ease of use and are available in standard tile sizes or made specifically to size. Please contact me for details. 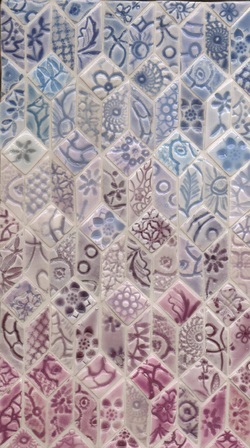 All mosaics are hand made and each is different.